Springfield, MO. 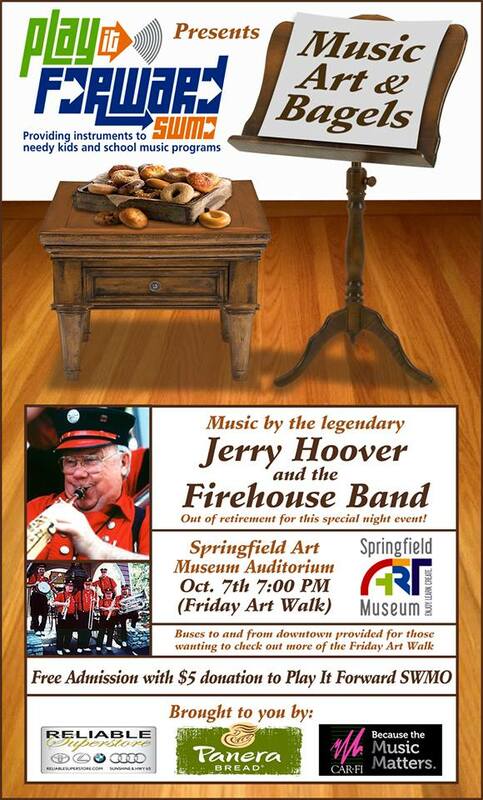 (September 21, 2016) - Please join the Springfield Art Museum and Play It Forward SWMO on Friday, October 7 at 7 PM in the Museum’s auditorium for the first in a series of First Friday concerts featuring the incomparable Jerry Hoover and the Firehouse Band. A $5 donation to Play It Forward SWMO covers admission to the concert. Admission to the Springfield Art Museum is free. All donations benefit Play It Forward SWMO, whose mission is to provide quality musical instruments to music programs and individuals in our community that are most in need. In addition, funds raised are used to repair and refurbish donated instruments. This concert series was designed not only to increase awareness for Play It Forward SWMO’s programs, but to highlight the diverse talents of musicians throughout the area. A new musical guest, scheduled by Play It Forward SWMO’s Director Ruell Chappell, will be featured at each concert. With generous support from Reliable Superstore, Car-Fi, and Panera Bread, guests of “Music, Art & Bagels” will enjoy complimentary snacks, free Museum parking, a roaring evening of jazz and Dixieland favorites, and can then take advantage of the free First Friday Art Walk Shuttle that will ferry them to Art Walk locations around downtown. For more information, please contact Joshua Best, Development and Marketing Coordinator, 417-874-2859 or jbest@springfieldmo.gov. Play It Forward SWMO is a Springfield based program begun in 2015 as a chapter of Play It Forward Musical Foundation in St. Louis, established in 2006. Their mission is to ensure children in SWMO, regardless of income level are provided with the opportunity to discover his or her musical talents. For more information, please visit www.playitforwardswmo.org or contact Ruell Chappell at ruell@playitforwardswmo.org or 417-848-6543.